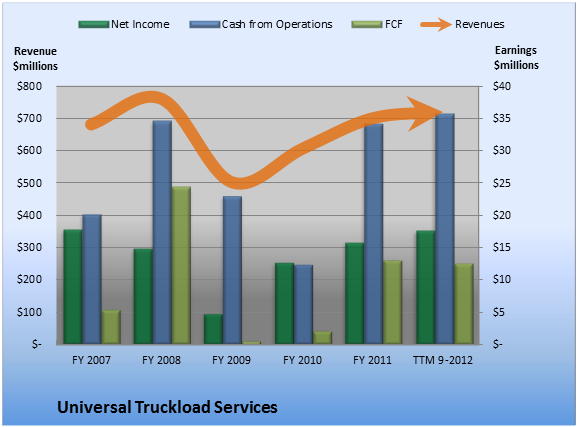 Over the past 12 months, Universal Truckload Services generated $12.5 million cash while it booked net income of $17.7 million. That means it turned 1.7% of its revenue into FCF. That doesn't sound so great. FCF is less than net income. Ideally, we'd like to see the opposite. 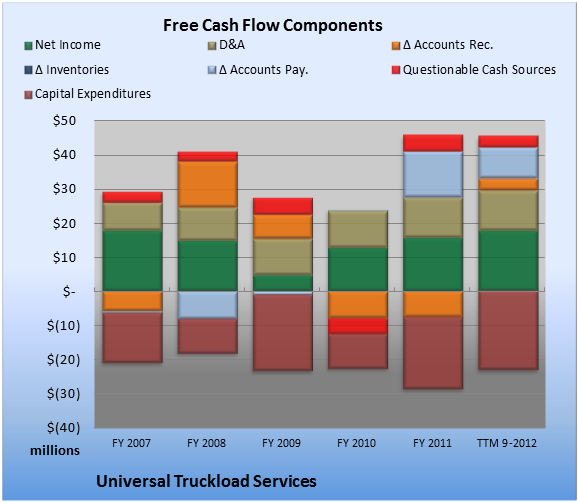 With questionable cash flows amounting to only 9.3% of operating cash flow, Universal Truckload Services's cash flows look clean. Within the questionable cash flow figure plotted in the TTM period above, other operating activities (which can include deferred income taxes, pension charges, and other one-off items) provided the biggest boost, at 11.7% of cash flow from operations. Overall, the biggest drag on FCF came from capital expenditures, which consumed 64.9% of cash from operations.